The excitement is building as the Easter Fashion Parade approaches here at dolledition.com. “Elise” has chosen her ensemble to represent the colors of an early spring garden. “Elise” steps out for the Easter Fashion Parade wearing her spring-green wool felt swing coat accented with a shell pink flower corsage, a matching spring-green felt hat and shell-pink dress. She’s carrying her basket celebrating spring. The roots of Easter go back centuries and are tied into the symbolism of spring, planting, and new life. The rabbit became an image for spring and eggs represented fertility. The German’s embraced the myth and used the idea of the “Easter Hare” laying colorful eggs as gifts to well-behaved children and hiding them in a garden. The legends were brought to America in the 1700s when Dutch and German immigrants settled in the Pennsylvania Dutch territory. Children made nests out of their hats or bonnets in hopes to attract the “Easter Hare,” and it’s colorful eggs. “Elise” carries her own Easter Fashion Basket to celebrate the promise of a new Spring. Details of Elise's spring swing coat are the double stitching and pale pink corsage accent. The back the hat for this ensemble is finished with a green velvet bow. Early European artwork is showing the “Easter Hare” arriving with colorful Easter eggs to hide for well-behaved children to find. Today, Dior’s global influence is as enduring and iconic as ever. Dior: From Paris to the World surveys more than 70 years of the House of Dior’s legacy, featuring a dynamic selection of over 100 haute couture dresses, as well as accessories, photographs, original sketches, runway videos, and other archival material. This exhibition profiles both Dior himself and subsequent artistic directors, including Yves Saint Laurent (1958–1960), Marc Bohan (1961–1989), Gianfranco Ferré (1989–1996), John Galliano (1997–2011), Raf Simons (2012–2015), and Maria Grazia Chiuri (2016–present), all of whom have carried Dior’s vision into the 21st century. Dior fashion models wearing "Vert gazon," "Gavroche," and "Flirt" ensembles (Spring-Summer Haute Couture collection, Slim Look line), 1961. Frogmore House has been a favourite royal retreat for more than 300 years. 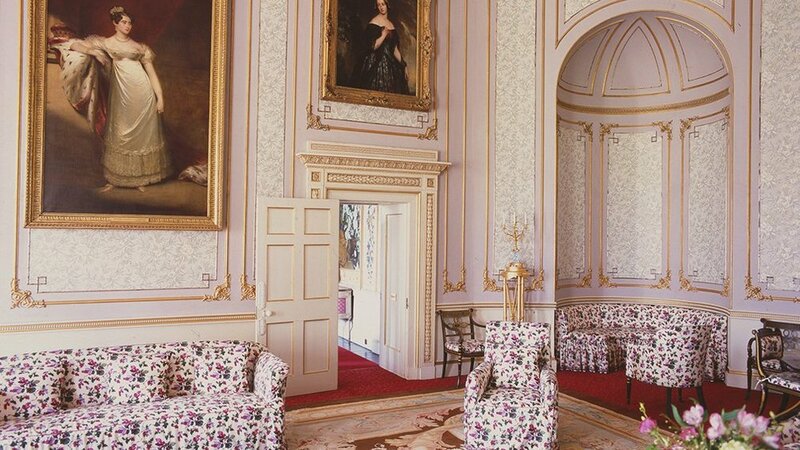 It became a royal residence in 1792 when it was bought by George III's wife, Queen Charlotte. Frogmore House - the location for the wedding reception of Prince Harry and Meghan (they’ve just moved to their new home Frogmore Cottage on the property.) Rarely available to the public, Frogmore House is going to be open three days in May for charity. For almost 20 years, Frogmore was the home of Queen Victoria's mother, The Duchess of Kent. Works by her and her daughter are on display in the house. Queen Victoria often visited Frogmore during her long widowhood and worked on her papers there. The American Department Store was an important retailer for the dolls of Madame Alexander. Both the department store and the Alexander Doll Company were at their zenith in the 1950s. One of my great joys of collecting is finding research material from the actual period that I am collecting. Some of the most interesting information and details of manufacturing show up this way. Several years ago I ran across a page from a Christmas catalog offering an assortment of dolls from the 1957 collection of the Alexander Doll Company. This page featured the type of artwork that was typically provided by the Alexander Doll Company for its retailers: Newspaper Mats and Glossy Prints available to you by request – was part of the Alexander Doll Company’s catalog given out to buyers. However, this merchant’s catalogs cover is a delightful drawing a-la-mode of a stylized interpretation of the American home in all its I-like-Ike glory. When you start to put the parts and pieces together, there is an unfolding of some of the many elements that are the story of the Alexander Doll Company. 1957 was maybe the pinnacle of the glory days of the Alexander Doll Company, which was operating three facilities. One of these, in White Plains New York, was shared with American Character and Arranbee. This facility is credited with the painting of the Alexander doll’s faces – up to 1,500 a day. However, another American icon, the family-owned, city landmark department store was also in its zenith, with the mall experience still a decade away. This particular catalog was from Forbes and Wallace, Springfield, Massachusetts. Their building had eight floors, with the eighth floor dedicated to the children’s departments. The Forbes & Wallace Russian Tea Room not only encouraged shoppers to stay in the store and return to shopping but also created a social experience and children’s memories. Going to see Santa and sit in his lap provided a unique emotional connection provided by these family-owned emporiums. Built in 1905, Forbes and Wallace went out of business in 1976. The downtown Springfield store was torn down in 1983. Downtowns had changed, and so had customers buying habits. A few of these retail palaces find a new life with a new purpose. Most get leveled – with the real estate more valuable than an attempt at renovation. Monarch Place has now incorporated the space. Elise 1957 #1635 blue ballerina - Elise was a brand new doll for Alexander, just being introduced that year. Forbes & Wallace featured the perennial favorites of Bride and Ballerina. The journey from Toy Fair, where the dolls are first viewed, to placing the dolls on the merchants selling floor is a long one. The chain of events for the department store developed a unique Alexander/Buyer/Merchant connection. Dolls being shown at the February Toy Fair were created, photographed, and text is written and worked out by fall of the previous year. Everything would be at the printers by January so buyers could walk away with the printed catalog in February at the New York Toy Fair. These were basically mock-up dolls at this point. Only after Toy Fair would materials be ordered and actual production start in quantities based on the number generated by Toy Fair plus a percentage of overage. This would be based on Christmas shipment. Some fabric prints and other parts and pieces might give out before all orders were filled. By mutual agreement, a comparable costume or character would be substituted. The Alexander Doll Company would not have had the space to store shipments of an entire line or worked on the production of an entire line at once. It is typical in the industry to ship production numbers to retailers as they are completed – with an agreement that the merchant would not be billed until the “ship by date” (i.e., October) and the store cannot sell until the billing. Forbes and Wallace made its selection of seven dolls to feature on this page. Given top billing, three Cissy’s are featured. Making her debut in 1957 was Elise. 16-1/2” to Cissy’s official size of 21”. Another 1957 introduction to the production line was Dumplin’ Baby. One of the dolls innovative features was that a 23 ½” doll was light enough for even a young child to carry around. The final doll illustrated in the Forbes & Wallace Christmas 1957 catalog page is Kathy Cry-Dolly. The journey of dolls designed, produced, delivered, received, displayed and purchased is all part of the Alexander Doll Company story. Mme Alexander was a rare combination of shrewd businesswoman with artistic talent. There were hundreds of retailers and merchants across the country that is part of this story. By a whim of eBay, this small slice of the big picture emerged of one of many fine emporiums that went through the buying process to compete with their own competition. While this might have been assumed to be the final page of this story, now as vintage dolls, this page is a long way off. Toys have morphed into collectibles, with some dolls like Cissy and the highly desirable earlier hard plastic dolls, could even be considered investments of an American art form. Cissy has been referred to as “the Jumeau of tomorrow” – many of these beautiful dolls have evolved into their own clubs and study groups. America is in a new phase of newly appreciating it’s great heritage and things American. There is not a better representation of this then the art and artistry of Mme Alexander and the Alexander Doll Company. Cissy 1957 “Opera” #2172 gowned Cissy shown in the Forbes & Wallace Christmas catalog page. Elise 1957 Bride #1650 - nylon tull gown with chapel length veil falling gracefully over her face and held in place with a coronet of flowers. Another 1957 introduction to the Alexander production line was Dumplin’ Baby. One of the dolls innovative features was that a 23 ½” doll was light enough for even a young child to carry around.The final doll illustrated in the Forbes & Wallace Christmas 1957 catalog page is Kathy Cry-Dolly (spelled “Cathy” by Forbes & Wallace) which could drink and wet and was a very early product made entirely of vinyl. The iconic toy store brand, known for interactive displays like its famous giant piano, is opening up a new store in Rockefeller Plaza. The store is opening November 16 and will be ready for the holiday rush. FAO Schwarz was originally known for its iconic store on Fifth Avenue. The new store is about five blocks south of the old one. The store is being developed by Threesixty Group, a product developer and distributor, which purchased the entire FAO Schwarz brand from Toys R Us in 2016. Supermodel Karlie Kloss will step into Heidi Klum's shoes as she takes on the duties of host while former winner and acclaimed designer Christian Siriano will lend his talents as mentor, taking over for Tim Gunn. Supermodel Karlie Kloss was also announced as the new host, as well as an executive producer, of Project Runway Wednesday, along with returning judge Elle editor-in-chief Nina Garcia and new judges fashion designer Brandon Maxwell and journalist and former Teen Vogue editor-in-chief Elaine Welteroth. While every detail of Princess Eugenie and Jack Brooksbank’s wedding ceremony was broadcast to 3 million people in the United Kingdom, their wedding reception was private, for family and friends only. Just the most basic details (like the evening party location, the Royal Lodge) were made public. The florals were created by Simon Lycett and Paul Thomas Flowers, using fall foliage and eco-friendly materials from Windsor Great Park. "Elise Takes a Trip" - 1971 FAO Schwarz Christmas Catalog - There was a trunk set price increase from $65.00 to 75.00 from the previous year. Elise got an unexpected career boost when both Cissy and Jacqueline were retired in 1962. There were no more large 21-inch fashion dolls for the Madame Alexander glamor treatment. 17-inch Elise, all of a sudden, came out of the sidelines to become the 1960s, and early 1970s fashion model for the long-running "Elise Takes a Trip" trunk sets put out by FAO Schwarz. Always a feature of their Christmas catalog, The trunks would use an Elise from that year's line, extra clothing from the Elise separates and add a few pieces provided by FAO to complete the trunks. While nothing as on point as the fashion Barbie was modeling, Elise did get pieces that were definitely "of the moment" and quite charming in their own way. This set has a "midi" length coat that was a reflection of the mini, maxi, and midi length wars of the times. There is a "granny" dress that was part of the hippy era, or for Elise, the folk music movement. The bell bottom pants set are another piece from this eclectic era driven by youth and their look-at-me-fashion, or at least the fashion that was pushed on them. Everything in this trunk set is tagged "Madame Alexander" except for the blue sweater and hat set and the blue check dress and bloomers. However, the blue and white check set is shown in the FAO catalog photo. FAO Schwarz kept the tradition of the "Elise Takes a Trip" trunk sets from 1966 to 1972. FAO had other Elise trunk sets under various themes starting in 1957, but the "Elise Takes a Trip" was an ongoing Christmas offering for many years. Dressed as the most famous of Southern Belles, Elise as Scarlett O'Hara wears an organdy gown trimmed with lace and rosebuds accenting her period costume. She wears a picture hat of Italian straw and more roses. Even her period lingerie has the same lace detail. The Alexander Doll Company catalog of 1963 states "This doll is a collector's item"... in hind site, this would become one of the most desirable Elise's the company made. Elise of 1963 was in a unique position in the Madame Alexander doll line-up. With both 21 inch Cissy and Jacqueline taking their final bows in 1962, this years 18 inch Elise got star treatment. She received the attention of a portrait doll, and was presented in a number of stunning outfits. This particular doll featured above is a rare example is of Elise with a Marybel face. The No. 1740 Elise Scarlett also came in the more familiar Elise mold. 1963 would be the last year for the 10 inch fashion doll Cissette. Madame Alexander seemed to be in a flux of what direction to take herself with the overwhelming success of Barbie's 1959 debut. Alexander would give a go at this market with the short lived introduction of 12 inch Brenda Starr in 1964 - renamed Yolanda in 1965. Regaining leadership in the ever changing doll industry with the American fashion doll seemed an elusive effort. Into her 60s by now, Madame still had a few surprises up her sleeve, and would regroup with the success of the eight inch American and International dolls. This very romantic portrait treatment of this Elise Scarlett has an extra level of interest using the Marybel face that sometimes appears in this particular time slot. The 1963 Alexander Doll Company catalog shows their Elise Scarlett with the more familiar Elise mold. The black hair used on this doll is an interesting detail not often seen with the Alexander dolls. Elise has also grown by an inch this year. She now described as an 18" doll - up from the previous two years as a 17" doll. From 1957-1960 Elise is listed as a 16-1/2" doll. The Elise Scarlett No. 1740 has lace trimmed pantaloons and the newer style sling-back shoes that was being used at the time for both Elise and the last years of Cissy. New article for UFDC and their Summer 2017 DOLL MAGAZINE... fourteen pages and 43 images. United Federation of Doll Clubs - their Summer 2017 magazine DOLL NEWS has my newest article "Elise - Over Time". Elise is the quiet one. Never as high profile fashion doll like her bigger sister Cissy or the legacy of Barbie, Elise did have quite a long doll career. From 1957 through her final bow in 1992, her design morphed several times and again as several different personalities. Some of her most interesting years were her bell-bottoms and mod fashion years of the mid sixties to early seventies when she was featured in the annual truck sets featured by FAO Schwarz. Elise gown No. 1750_1966 - This was also used for the 1966 FAO Schwarz Elise Takes a Trip" trunk set. 1966 was a very interesting year for "Elise". She spent her first years as the more demure little sister for 20-inch "Cissy," who got a two year head start. "Elise" made her debut in 1957, and the two dolls tended to be a shadow of each other, and available in many of the same outfits and matching extra boxed clothes. "Cissy" was retired, with her last appearance in 1962. "Elise" however, was just getting started. She had a number of mold and body tweaks... and grew from her original 16.5-inches to 18-inches in 1964. In 1965, the new "long neck" 17-inch version appeared and "Elise" would stay in this format until 1992. For this one year, "Elise" was renamed "Polly" along with "Leslie," a black version of the same doll. "Elise" also started her use as "Maria" of the Sound of Music series in 1965. "Elise" Queen - 1966 FAO exclusive... a very rare doll. "Elise" was about to get a huge career bump in 1966 by FAO Schwarz. The new 20-inch fashion doll "Coco" got all the headlines in the company 1966 catalog. Alas, "Coco" was a very problematic doll for the Alexander Doll Company. Production issues and the association of the dolls name with Coco Chanel, but without licensing, caused many problems. However, at FAO, "Elise" was given the first of a series of their exclusive trunk sets that sent her on tours dressed for the new decade. She was available in bell-bottoms, short skirts and the newly popular a-line "baby doll" dresses. The formals and prom dresses were still available, but "Elise" was now styling for her generation. In 1966, FAO also had an "Elise" exclusive as a Queen - with all the royal flourishes expected of a doll from Madame Alexander. Queen Elizabeth made a visit to the United States this same year. With a long doll career ahead of her, "Elise" was used for the now iconic FAO exclusive Elise trunk sets until the early 1970s. FAO Schwarz would make a great deal of use of "Elise" in the mid 1960s to early 1970s. Queen Elisabeth 1965. Queen Elizabeth did extensive world tours in 1965 and 1966, including the United States 1n 1966. Elise 1967 exclusive FAO Schwarz "Elise Takes a Tour" trunk set. Cissy does her errands with great panache in her nautically inspired ensemble - of course her French Poodle makes for the perfect accessary! Nautical was part of the 1960 FAO exclusive Royal Tour Trousseau. It was also available as an extra Madame Alexander boxed outfit. This, along with a handful of other extra boxed outfits in 1960, came at the end of the career of Cissy as a mid century fashion doll that featured extra clothing and accessories. In hind sight, this was the curtain call after seven years for this large fashion doll. Cissy set the fashion doll standard for the American doll market. To confuse things just a bit, there was also a 1958 Nautical for both Cissy and Elise with red pleated skirt and a white jacket. The 1960 Nautical was also available as an extra boxed outfit for Elise. The halter top is a remarkable application created with lingerie elastic... the midriff detail shows how tuned in Cissy was to the fashion of her day! The 1950s delighted in whimsy, and sailor and nautical inspired designs fit well with this love of novelty and themes — its popularity remained consistent throughout the decade. The hugely popular 1958 movie South Pacific made these nautical and yachting themes more and more popular going right into the 60s. The launch of Barbie in 1959, along with a tremendous boost with the help of her TV ads on the Mickey Mouse Club and other children's programing changed the manufacturing pecking order. The course the business side of the doll industry would take, along with the newly morphed image of the American fashion doll, was dramatically redefined. Cissy in the 1960 Nautical ensemble used both by FAO Schwarz in their Royal Tour Trousseau and by Madame Alexander as an extra boxed outfit for Cissy. This Nautical outfit was also available for Elise, No. 16-30. Sears, like fashion retailers across the United States, also promoted the fashion mania of nautical and navy looks - children, adults and fashion dolls alike wanted the look! Elise was in all of her glory in 1959. She was available in both pink and the more expected soft white for both a bride and bridesmaid. Pink was all the rage from cars, prom dresses, swimming pools and appliances. Vogue magazine was all about "think pink". So, here you - Madame Alexander in all her design glory. She also made liberal use of pleated fabrics for both of these dolls. Taken for granted now, pleated commercial fabrics were the development of new technology at the time, and this was cutting edge doll making. My absolute favorite part of the Madame Alexander Conventions are the competition dolls. Each year is like a private exhibition of the rare and beautiful just for that years convention - Never to be repeated exactly again. Besides sharing what I collect, my passion is finding perfect dolls that reflect exactly how it left the factory. This is easier said than done. The search gets harder each year and the competition for these dolls is intense. Fascinated by minute details, this type of doll offers to me a vast amount of insight on what the design process was even down to how the dolls were placed in the box for the best possible effect and for the best shipping. In getting ready to take my dolls to a convention, I make special boxes for them to travel in. Most of these dolls rarely see the light of day, so everything that I can realistically do to provide a safe trip to and from the convention I try for. Minneapolis was one challenge after the other and traveling with these dolls added some serious stress. We're all back home safe and sound... and it was a wonderful adventure but not without it's trials and tribulations. Viva the Madame Alexander Doll Club! Cissette 1963 No. 735 with Jaqueline face. Brides are and have been one of the perennial favorites of the Alexander Doll Company. Mid century, these were among the most glamorous of their doll lines — perhaps giving Madame Alexander an opportunity to enjoy some fantasy in her fashion doll creations. This Elise Bride is from 1960, which was a fascinating transition for the Alexander as they turned the corner regarding their fashion doll philosophy. While 21" Cissy was the companies cash-cow from 1955-1958, that large fashion doll trend started to lag in 1959. By 1960, Cissy was essentially a portrait doll in period costuming except for the Bride and Queen of that years line up. Elise often would mirror her bigger sister Cissy, and this is a nice example how they would sometimes be similar, but different. Elise, however, would continue in the line as a fashion doll for quite awhile and get a major transformation in the mid 1960s and go forward into the 1980s. Princess Margaret was defiantly the bride of the year with her Westminster Abbey wedding May 6, 1960, to Antony Armstrong-Jones. On the other end, March 4, 1960, Lucille Ball filed for divorce from Desi Arnaz. Elise 16 1/2" Bride No. 1735 mint in box from 1960 by Madame Alexander... Cissy of this year would also have a variation of this bride. Heavy slipper satin, beaded lace, cathedral length bridal veil and a coronet of flowers - Elise reflects on her choices. The 21" Cissy version of this doll - No. 2180 from 1960. Cissy, from 1960 through her final year in 1962, sometimes received false eyelashes over their factory eyelashes. Princess Margaret had the wedding of the year in May of 1960. Her wedding gown was designed by Royal Family favorite designer Norman Hartnell, who also designed her sister, Elizabeth’s wedding dress in 1947. Exploring fashion always turns up trends du jour — sometimes lasting a decade and sometimes just a season. The houndstooth suit of our featured 1964 Elise is a wonderful example of a fashion trend in miniature. Houndstooth originated in Scotland in the 1800s and was originally worn as an outer garment of woven wool cloth by shepherds. Fast forward 130 years and houndstooth became a symbol of wealth, worn by the upper class in Europe and for American mens suits. Christian Dior used houndstooth, which was one of their favorite design motifs. The 1960s saw the pattern revived by American fashion designer Geoffrey Beene - sometimes used with lace, and a favorite for his women's dresses, coats and a wide range of accessories. The houndstooth pattern would be a huge trend throughout the 1960s — even used by Chevrolet for car seat upholstery. Home decor got the houndstooth touch with fabrics, wall covering and carpet design. Returning again, designer Tom Ford featured houndstooth in his fall 2015 mens collection. Houndstooth was a 2015 fashion favorite on the European runways, showing up in Paris and Milan. Elise wears her very trendy 1964 houndstooth suit with the contrasting large white pique cotton collar with an accent of lipstick red velvet bow, heels and coordinating red straw hat — very much à la Geoffrey Beene. Not only did Madame Alexander capture the houndstooth moment in 1960s fashion, but the new silhouette of fashion and the influence of mens clothing accents being used in women's fashion. Dior houndstooth short jacket with "fly away" back and black wool pencil skirt - From the 1948 spring collection. Geoffrey Beene - featuring some of his mid-1960s design using houndstooth fabrics. Elise sits for a few minutes while the poodles play. In Godey era fashions of about 1860 - a very full pleated skirt and fashionable straw hat of the period. Portrait dolls were trending with Madame Alexander. The tides of popularity were changing dramatically in an industry spinning from the introduction of Barbie. In Philadelphia in 1830 Louis Antoine Godey (1804-1878) commenced the publication of Godey’s Lady’s Book which he designed specifically to attract the growing audience of American women. The magazine was intended to entertain, inform and educate the women of America. One of the most popular features of Godey's Lady's Book was the beautifully illustrated hand-colored fashion plates depicting the latest in women's fashions were published. More than 150 women were employed to hand tint the plates for each issue. In 1830 in Philadelphia, Louis Godey first published Godey's Lady's Book as the Lady's Book. In 1837 Godey bought the Ladies Magazine of Boston and made its editor, Sarah Josepha Hale, the literary editor of his periodical. In matters of fashions, etiquette, home economics, and standards of propriety, Godey's was the last word. Godey's Lady's Book continued to flourish throughout the Civil War under the long editorship of Mrs. Sarah Hale, but by 1877, Louis Godey sold the magazine and Mrs. Hale retired. The magazine was purchased by several owners and in 1898 ended its 68 year existence. Perhaps meant as a companion to the 1960 Cissy Godey Girl, the Godey Elise shares the same vibrant colors and pleating. My ten entries for the 2014 MAAME ALEXANDER DOLL CLUB CONVENTION in Philadelphia, PA are diverse but for the most part, share a common thread of either very brief production, or a specific turning point in either manufacturing techniques/material or tastes of the public. Back from the 2014 MADAME ALEXANDER DOLL CLUB CONVENTION in Philadelphia, and for myself, one of the highlights is the Competition Room. It's agony and ecstasy is always part of the experience, and what an experience it is! Making the selection comes quite some time ahead of the convention because your entries have to be submitted to the chairperson months in advance. I'm obsessive - compulsive about the process, and enter the maximum of ten entries. For me, it's a little like packing for a weeks trip - if there's a chance of rain, snow, heat wave or a red carpet, I've got it all crammed-in. The complications of bringing ten outstanding dolls is daunting, with all kinds of extra planning, weeping and whining. With that said, it is also one of the great joys of collecting. My own collecting has become driven over the past five years by my article writing and seminars. I don't have a magic closet, so, off we go on another adventure to find the best examples I can to help tell the story of the people, events, social and technical transitions that create the conditions for these wonderful dolls to happen. My competition entries this year certainly are illustrative of this journey, with several very interesting dolls that represent just a fleeting moment of doll production or trends of the doll industry and whims of the public. No, 6. A wonderful example of the very rare 14" 1948 "BALLERINA". Featured in the 1848 FAO Schwarz toy catalog, the doll is based on the star ballerina of the "SWAN LAKE" ballet. "BALLERINA" came in two sizes: FAO no. 16-58 ($10.00) for the 14" doll; and FAO no. 16-70 ($13.95) for the 17" doll. From the 1948 FAO Schwarz toy catalog, "BALLERINA", based on the star ballerina of "SWAN LAKE". The catalog describes the doll: "Here is the graceful star ballerina of the "SWAN LAKE" ballet, beautifully dressed in a a dazzling ballet costume trimmed with silver, with mohair wig with braided hair-do." This is the fascinating doll I used for the poster of my MADC Philadelphia seminar. "BALLERINA" is a unique bridge in design and technology to the previous "KAREN BALLERINA" and the following "NINA BALLERINA." This example has its box with Alexander Doll Company number of 5100 for the 14" doll and the FAO sticker with their number of 16-58. A unique doll that's not easy to research, the FAO catalog and the dolls Alexander Doll Comapany box, with corresponding numbers, helps to create a research anchor and establish the dolls legacy. No. 4. 1948 "STORY PRINCESS" from ZCMI Department Store - based on the Salt Lake City KSL Radio character of the STORY PRINCESS performed by Arlene Dalton. Arlene Dalton, who was the voice of KSL Radio character the "STORY PRINCESS," would later go to New York and take the STORY PRINCESS to the Howdy Doddy Show. She would next move to the Perry Como Show. Coming back to Utah, she would work with the Osmond family in their Orem studio. This 1948 doll came in the trademark ZCMI gold box with the Alexander Doll Company label on the inside lid. In a 1949 radio article, ZCMI store management is quoted saying the one thousand "STORY PRINCESS" dolls ordered sold out in four weeks. Their only regret was not ordering an additional 500. A very rare doll, this is an unusual verification of exact numbers produced - which is often next to impossible to establish. Again, a very rare doll that ties in the department store with the radio station and their trademark personality of the "STORY PRINCESS", with printed documentation of the specific (very limited) quantity produced. Arlene Dalton would touch the lives of millions of children through both radio and TV. No. 8. 18" Elise 1963 RENOIR PORTRAIT No. 1735 - with the 1962 21" JACQUELINE (Kennedy) removed from production, the Alexander Doll Company needed a fashion doll star for 1963. Elise grew and inch, and was dressed in her most elaborate costuming to date as a series of stunning portrait dolls to become queen of the 1963 catalog. This 18" Elise 1963 No. 1765 RENOIR PORTRAIT is very interesting in several ways. By a series of events out of the control of the Alexander Doll Company, Elise became the fashion doll star of their 1963 company catalog. Jacqueline (Kennedy) getting the boot via the request of the Kennedy White House, the company must have been scrambling for a quick replacement. Elise to the rescue in a stunning series of portrait dolls created that year to fill the opening left by Jacqueline. Beautifully executed, the RENOIR PORTRAIT is a surprisingly complex gown which includes some detailed accessories. The hair color for this doll is a unique dark brown and is listed in the company catalog as being patented. Even then, the doll is referred to as "a collector's item" in the 1963 company catalog. No. 7. 1966 COCO No. 2030: Ice pink brocade sheath ball gown, trimmed with matching pink marabou. Produced as both a portrait doll and as "COCO." Described in the company catalog: "considered on the the most dramatic and attractively dressed mold of all times, and is a perfect fashion companion for all growing girls." 20" COCO is remarkable for the obvious interest of the Alexander Doll Company to create their "next big thing". Just as the company did not have Shirley Temple in the 1930s, they did not have a Barbie for the 1960s. COCO required a tremendous amount of development and design to create a new doll from the ground up - not even her shoes were a carryover. To take it ever further, the portrait doll series has a slightly different mold than the thinner COCO fashion dolls. Adding to the mix, Alexander walked a very fine line of risking being censured by the fashion house of Coco Chanel. Marketing the doll was a sensitive situation possibly escalating her demise after only one year. No. 9. 1946 composition 14" PRINCESS MARGARET ROSE. This was right at the transition from composition to hard plastic. The composition finishes by 1946 were at a remarkable standard. 21" "PRINCESS MARGARET ROSE" for a 1946 Montgomery Wards catalog, available in pink, yellow and blue. Featured on the bottom left of the page is "KAREN BALLERINA." With tulle not yet developed, highlighted is the dolls rayon net available in blue, green, white and yellow. My personal favorite this year's convention is my 14" composition "PRINCESS MARGARET ROSE," first place and Judges Choice winner. This is such a romantic interpretation of Princes Elizabeth's younger sister, Prince Margaret Rose. At this point in time, Margaret was the glamor-puss of the royal family, and was getting many of the magazine covers. Margaret was just on the verge of her world famous, and ever so tragic love affair. Aborted by the orders of her older sister, Queen Elizabeth, this was the stuff of timeless tragedy. Sympathetic to her sisters situation, Elizabeth ultimately bowed to the objections of the Queen Mother regarding Margaret's love interest, Peter Townsend, being a divorced man.